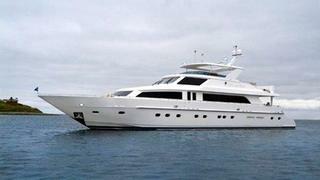 Michael DiCondia at Hargrave Custom Yachts calls with news that, having been withdrawn from the market a few months ago, the 34.74m raised pilothouse motor yacht Sea Legend is now actively for sale again. Built by Hargrave in 2009, she features an interior in high-gloss cherrywood trimmed with gloss camphor burl accommodating seven guests in four en-suite staterooms. Twin 1400hp Caterpillar engines give Sea Legend a cruising speed of 12 knots and she also features those all-important zero speed stabilisers. Sea Legend is available for showings during the Fort Lauderdale Show at the Marina Mile Shipyard and is asking $6.5 million.